“Perfect Life” is a fictional account of two women whose lives are anything but “perfect.” Set in the recent past, director Emily Tang’s slow-paced, gritty film deals with the harsh reality of getting by in China’s urban landscape with no apparent marketable job skills. Li Yueying (Yao Qianyu) is a single woman in her early twenties from a dysfunctional family in Shenyang, north-east China. When she quits her factory job to take up work as a hotel chambermaid, she meets a mysterious amputee from Mongolia who is determined to be her benefactor. The action switches confusingly between Yueying’s story and that of the parallel life of an un-named single mother (Jenny Tse) in her mid-thirties. The character’s predicament is intended to be a life barometer of Yueying’s future. The two women’s paths eventually cross in Shenzhen City in the final scene, but the meeting seems incidental. 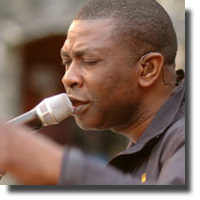 Pierre-Yves Borgeaud’s musical road film follows Senegalese singer Youssou N'Dour on his personal pilgrimage to bring to his homeland a jazz repertoire of his music performed by a diverse group of fellow musicians who share a common empathy with the African continent. Since N'Dour was first exposed to western audiences through his collaboration with Peter Gabriel, he has been heralded as the African Artist of the Century (Folk Roots magazine). He has also become a cultural icon and a powerful advocate involved in social issues. On to New Orleans and the Snug Harbor jazz club where N’Dour and Genoud re-unite with virtuoso drummer Idris Muhammad and bass player James Cammack. Muhammad (formerly Leo Morris) as it turns, has played with the best, including Fats Domino and Sam Cooke. The band is enlarged further after stops in New York and Luxemburg. The film concludes with the concert in Gorée, an island museum that lies a few miles from the port of Dakar. Today, it is symbolic of the African diaspora and serves to honour its victims. When celebrities, particularly rock musicians die prematurely and in suspicious circumstances, it naturally prompts, more in hope than rationale, public sightings. Tabloid newspapers frequently report such unsubstantiated sightings of Elvis Presley and Jim Morrison; even Jimmy Hendrix has popped up on the odd occasion. But John Lennon? When Lennon was pronounced dead at the Roosevelt Hospital in New York City after being shot in the entrance of the Dakota appartment building by Mark David Chapman on the 8th of December, 1980, most of us (sadly) accepted that he was gone forever. Peter McNamee, in a “what-if” mockumentary, has explored the thought-provoking premise of the enigmatic musician actually surviving the fatal incident and even more amazing, is still alive and living in a small northern Ontario town. The cinematography has a deliberate amateurish “look ‘n feel” about it as a pair of junior film-makers employ a broad selection of surveillance equipment and handheld cameras. McNamee uses only professional actors in “Let Him Be.” Kathleen Munroe, Sean Clement play Kathleen and Tim, a pair of undergrad film students who set out to prove (or disprove) the questionable existence of the ex Beatle. What they find is an accomplished musician who looks and sounds like Lennon, but is he the real thing or a talented fan? Flip Scipio is a master guitar maker who has produced custom-made guitars for the most discerning musicians around. His client list includes Jackson Browne, Ry Cooder, Carly Simon and Paul Simon, who all appear and perform in the movie. But this craftsman’s true genius lies in the restoration of old or seriously damaged guitars and making them sound better than new. 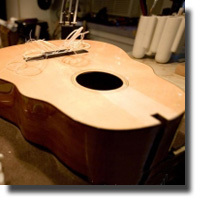 He is the “go-to guy” for people like Keith Richards and Paul McCartney when they require the specialized workmanship that only someone like Scipio can provide. Director Claire Pijman first met her subject while filming the "Buena Vista Social Club" with Wim Wenders in Havana in 1999 and it’s this encounter that provides the film’s starting point. Pijman’s Dutch documentary crew then follow the soft-spoken guitar technician to his workshop on Long Island, New York and on to his meetings with famous musicians which essentially forms the core of the film. This is an elegantly filmed, slow-paced documentary that offers a rare glimpse at the craftsmanship behind some of the most celebrated music of today.